It’s not a major event unless Sir Patrick Stewart and Sir Ian McKellen release an adorable photo about it. The duo—who are currently starring on Broadway/being best friends in New York City—have snapped photos to celebrate various holidays including Halloween, Thanksgiving, Questlove-day, Christmas, New Year's, and Wednesday. And they’ve now sanctified another special event with their glorious friendship: The Super Bowl. 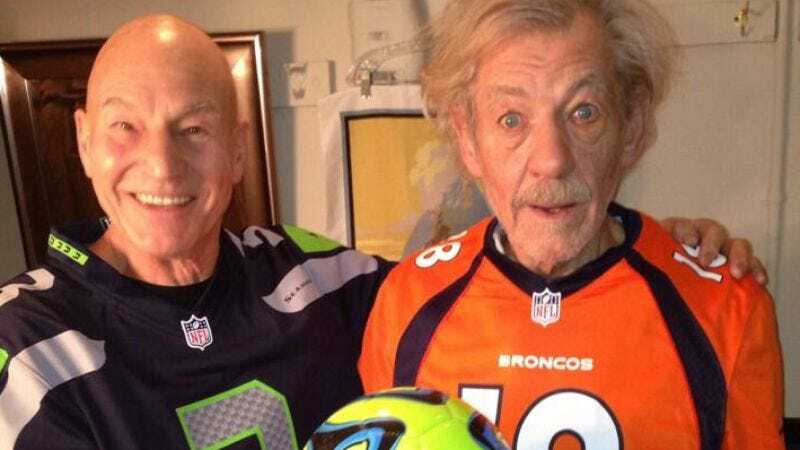 Sir Patrick donned a Seahawks jersey, while Sir Ian selected a Broncos one to snap the delightful picture ahead of Sunday’s game. And lest they be decried for abandoning their British roots, they posed with a soccer ball as well—reminding Americans that to the rest of the world "football" means "soccer" and we are really weird (but in just about the most charming way possible). The faint of heart would do well to start preparing for the duo's inevitable Valentine’s Day photo now because it's going to be glorious.